Hello everyone! It's November already! Have you started counting down to Christmas yet? Let me countdown with you! 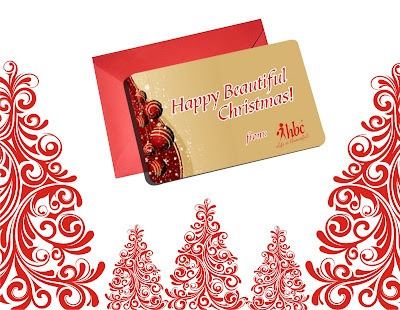 Everyone wants to enjoy the upcoming holidays and to help you enjoy, HBC is sharing with you 8 ways to a happy and beautiful Christmas. Each week for 8 weeks, we will be sharing tips and featuring HBC products which you can win just by simply answering the question of the week. The right products make a world of difference when it comes to taking care of your crowning glory. Beat frizz, tikwas, and all traces of a bad hair day with a few drops of serum, a mist of hairspray, or a dollop of gel. Anti-frizz or shiny finish? HBC has got you covered with these products from Hortaleza Professional. Stylize everyday with these great finds. Share this giveaway to your friends through Facebook OR Twitter. Make sure your posts are public so I can check. 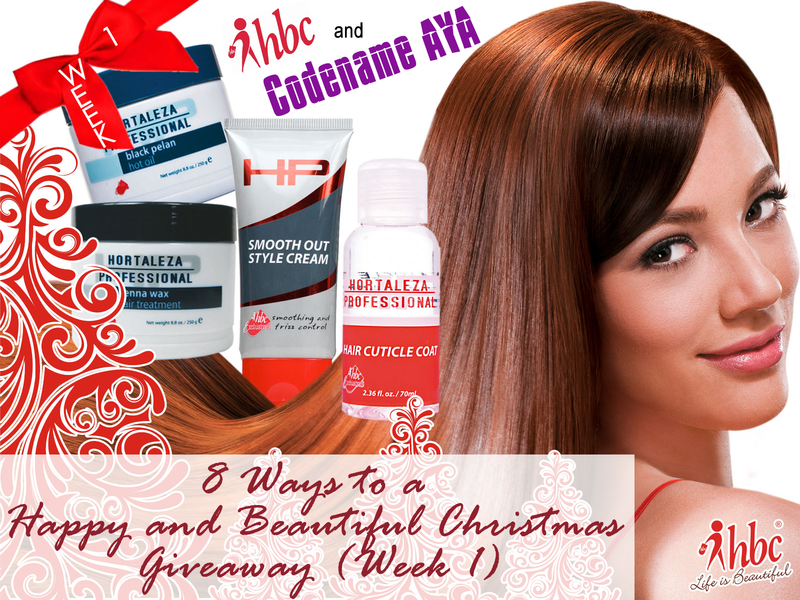 Facebook (tag HBC) - "Enjoy the holidays with HBC and Codename AYA by joining the "8 Ways to a Happy and Beautiful Christmas Week 1 Giveaway." http://ayanagrace.blogspot.com/2011/11/giveaway-8-ways-to-happy-and-beautiful.html"
Twitter - "Have a happy and beautiful Christmas with @tweet_hbc and @CodenameAYA. Join this giveaway: Week 1 - http://j.mp/snB0Ld "
Answer the question of the week. Post this giveaway on your blog sidebar (+1). Make a blog post about this giveaway (+1). Week 1 giveaway runs from November 8 to 13, 2011. Two (2) winners will be chosen every week. The participant with the best answer will be selected as a winner. The second winner will be chosen randomly. I will contact the winners after one week and s/he will be given 2 days to respond. Failure to respond within the given time limit will cause the winner to forfeit the prize. The prizes must be claimed at the nearest HBC store. Disclaimer: Prizes provided by the company for giveaway purposes. 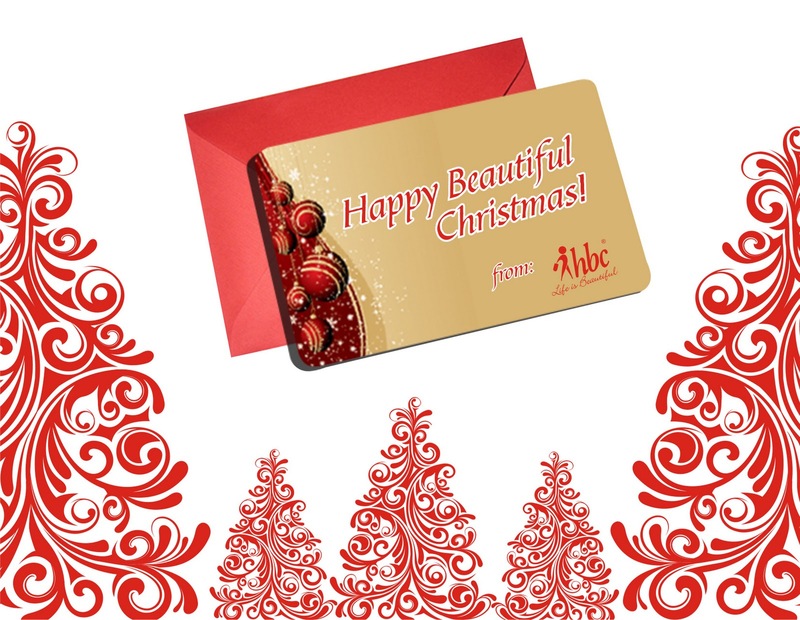 Winners will have to claim the prizes themselves at the nearest HBC branch. Thank you Merry Jane! Interesting story, ha! Haha ice cream on the hair. Iba 'yun ah! Answer to the question of the week: I think what makes a great-looking hair is one that doesn't frizz out and has a beautiful shine to it. I went out on a date with this guy and we went around makati, got rained on and everything. The date itself was great but after the date he commented how frizzy my hair was. I was mortified! On our next date i used HBC's Henna Wax hair treatment on my hair and to my amazement he commented that my hair was better that day. It wasn't frizzy anymore despite the fact that it also rained that day and we hang out in a really windy place. Answer to the question of the week: A great looking hair for me is with no freaking baby hairs because one time when I'm going to my duty in the hospital as a student nurse we should be neat and clean and the hair is not exemption, I lots of baby hairs or "tutsang" so I feel uncomfortable with my hair so I used my Hortaleza professional Hair cuticle coat and in an instant my baby hairs are tamed. Unbelievable! Worst Bad Hair Day EVER today! No way was I going to let it ruin my whole day – too many places to go, people to see, things to do, stores to shop! I went to a beauty parlor one day before our company's out of the country seminar. The hairdresser hadn't given me the auburn highlights I wanted, she transformed me into an almost burgundy red-head. I shrieked in horror and told the hairdresser that she got it completely wrong. She seemed not to care and just said that this was a much better look. When she then shrugged and said "Sorry" as if she didn't even care about my looks had a complete melt-down. Eventually I calmed down and asked myself what it was that I was so upset about. Was the hair really so awful? Well it wasn't what I wanted, but it wasn't as bad at all. After all, hairdressers play an important role in supporting our self-image and you have to be able to trust them to make you feel good. My bad hair day ended up teaching me a lesson about establishing boundaries and not putting up with unacceptable behavior. VOILA!!! It came out Fabulously!!! NOW my day is back in control and moving in a positive direction – because, you know, if you feel good, you look good and when you look good you are FABULOUS! Next time you have a bad hair day – just say – this is just bad hair, and it’s not going to ruin my whole day! Do a quick do over and you’ll be ready to show the world your most fabulous you! Answer to the question of the week: i was on my vacation and i had my hair relaxed and after 3 days, i took a bath. then, i thought it was going to be a bad hair day coz my hair got frizzy and tangled. i spend my whole time combing it and still, it looks like a horse's tail! i don't even wanna go out to attend mass and go shopping! i thought that my hair would spoil my vacation! thanks to my ever trusted hair serum. it made my hair looks shiny, easy to comb and the frizz was gone! aside from making my crowning glory beautiful, it made my day so worry-free! Great looking hair for me is having a hair that is convenient, easy , manageable and having an inexpensive style. One time, I have this an unforgettable hair nightmare, literally, I just had a dream that my hair was so dry and brittle. No matter what I did, nothing would help. I spend tons of money on all the best salon brand, conditioners and all the treatments and nothing worked. My hair was so bad that I could take a bunch of strands, tug on them just a little bit and they snap in half. Then I woke up in panic. I thank God its only a dream, a nightmare, an unforgettable hair nightmare. After that, I realized that I really need to take care of my hair. It translates/means into a good shampoo, conditioner and even hair treatment and the only thing that suits the best is hbc. Plus the fact that I also use a good brush because it can make all the difference when it comes to hair and making it look great. After using hbc, I loved the convenience of having a "GREAT HAIR EVERYDAY" and a style that always look fabulous without the hassle. When it comes to hair, we shouldn't stick to just one brand that we tries once and were happy with. And you know what it is. Answer: The great looking hair for me is tangle -free hair, manageable and shiny. My unforgettable hair nightmare was when I was in high school my Mom convinced me to have my hair permed,after the treatment it was fine but when I get home and a day passed I had it shampooed and dry it was so frizzy. I was then so tan after the volleyball tryouts. I look so funny and ugly. Great-looking hair is very essential in overall physical beauty. Hair should be smooth, shiny and free from split ends and tangles. I do really have super frizzy hair.. What I do is I used HP Hot Oil treatment coco milk everyday! Haha that sounds so weird but everytime I use Hp HTCM I feel so pretty! Because I can feel the softness of my hair :D That's it.. Hihi. Answer to the question of the week: Great looking hair for me is having a shiny and silky smooth hair. I always flat iron my hair as in like everyday.. there was a time that i had to attend an event and my hair wasn't cooperating its frizzy and my fringe was too short and unmanageable that time so i had to leave and looked for comfort room to have it fixed. I was so relieved that my sister left her HP hair cuticle coat! i applied it on my hair AND VIOLA i instantly fixed my hair and headed to the event. I had my hair rebonded three times this year...It made my hair so frizzy, dry and dead looking...To repair my dead hair, I used deep conditioning treatments and serums and used hot towel for 3 months!...I learned my lesson: eat healthly, use good hair products, cut the ends of your hair and never rebond your hair thrice a year!! !